In 2006, Americans represented 4.6% of the world's total population, but 23% of the world's obese population (source: WHO, 2006). • In a study of 344 adults, the beneficial effects of omega-3's DHA and EPA on cardiovascular health were greater in those who exercised regularly compared to those who were inactive (Muldoon MF, et al. 2013). It's time to stop evaluating diet and nutrition issues independently of the physiologic effects of exercise! In this discussion, I will explain four dietary guidelines that need to be modified for athletes and other very physically active people (eg., landscapers, firefighters, construction workers, etc). In the past, many consumers have been led to believe that all carbohydrates are bad. While a little more sanity seems to have returned since then, there are still those who feel that carbohydrates should be avoided. One reason why people believe they should avoid carbohydrates is because of diets like the Atkins Diet and the Paleo Diet. Both of these diets recommend a decreased intake of carbohydrates: The percentage of calories from carbs in clinical studies of a Paleo-style diet ranged 40% (Lindeberg S, et al. 2007) down to 32% (Jonsson T, et al. 2009). The Atkins Diet limits carbs even more drastically: to no more than 10% of calories. • Too Much Fat: Dean Ornish, MD, has shown that coronary disease improves when fat makes up only 10% of daily calories, but progresses on a diet that contains 30% fat. People following the Atkins Diet often consume 40% or more of their calories from fat. That's too much. Because of this, and other reasons, Dr. Ornish is not a fan of the Atkins Diet (Ornish D. 2004). • Too Few Carbs: I attended a sports nutrition conference at the University of Arizona several years ago. One of the sports dietitians summarized a large football lineman she worked with. This athlete was complaining of feeling tired during practice despite consuming "13 chicken breasts per day!" Yes, really. He mistakenly thought that he needed to emphasize a high percentage of protein in his diet. In doing so, he wasn't consuming enough carbohydrates. Carbs and fats are your main sources of energy, with carbs being the rapidly-burned calorie source while fats are burned more slowly. After the sports dietitian reduced his protein intake and increased his carbohydrate intake, this athlete felt like he had a lot more energy. OK, so, what is the "right" amount of carbohydrates in our diet? The Federal government publishes nutrition guidelines every 5 years. The latest set, "Dietary Guidelines for Americans, 2015-2020," was released in January 2016. 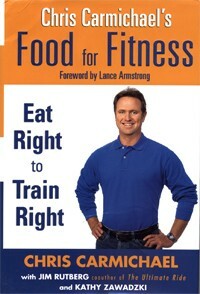 • In Food For Fitness - Eat Right to Train Right, author, coach, and former elite cyclist Chris Carmichael recommends a diet that provides 60-70% of daily calories from carbohydrates during strenuous and/or prolonged exercise. • Dan Benardot, RD, PhD, in "Advanced Sports Nutrition, 2nd ed.," recommends carbohydrates make up 55-65% of the diet for athletes. • Susan Kleiner, RD, PhD, in her book "Power Eating, 4th ed.," developed the following diet for an NFL football player: 60% carbs, 25% fat, 15% protein. • In 2009, the American College of Sports Medicine (ACSM), along with the American Dietetic Association and Dietitians of Canada, published the Position Statement "Nutrition and Athletic Performance" (Rodriguez NR, et al. 2009). They cite 9 studies that show improved athletic performance on a diet where carbs provided 60% or more of the calorie requirements. So, general nutrition guidelines recommend a diet that provides 51-55% of daily calories as carbohydrates, while sports nutrition experts recommend that 60-70% of your calories come from carbohydrates. Which one is correct? ANSWER: Both are appropriate, but, as I mentioned, exercise needs to be considered to provide an accurate answer. One reason for the lower carbohydrate ratio suggested in the Dietary Guidelines is to acknowledge recent evidence showing that dieters can lose weight on higher-protein diets. By allowing for a higher percentage of calories from protein, the percentage of carbohydrates is less. More importantly, the Federal Dietary Guidelines don't pertain to endurance athletes. The critical detail to consider here is the total number of calories consumed per day. An overweight person who is dieting and not exercising vigorously may be consuming only 1200-1500 calories per day. But, elite athletes like Tour de France cyclists burn up as much as 9000 calories in a single day. To provide 9000 calories per day, a diet with less than 60% carbohydrates would contain too much fat and too much protein. The next distinction to be made is the difference between simple carbohydrates vs. complex carbohydrates. Simple carbs are smaller molecules, and absorbed quickly. Examples are sucrose (aka: table sugar), glucose, fructose, lactose, and several others (eg., maltodextrin). Complex carbs are much larger molecules and are absorbed more slowly. An example is the starch that is found naturally in vegetables. Carbohydrates are easier for your body to utilize during exercise than either fats or protein. 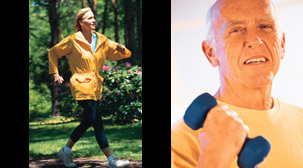 As exercise intensity increases, your muscles preferentially burn carbohydrates for energy. Unfortunately, your body only stores about 2000 carbohydrate calories compared to 50,000 or more as fat! So, during prolonged exercise, you will run out of carbohydrate energy reserves long before you deplete your fat reserves. Carbohydrates need to be resupplied regularly because they are so easily depleted. What this means is if you are on a long bike ride or hike, running (or walking) a marathon, or playing a 3-hr tennis match, you need to ingest carbohydrates periodically. And simple carbs are preferable to complex carbs because simple carbs are absorbed more quickly from the GI tract. Sports drinks and energy gels contain simple carbs such as glucose, fructose, and sucrose for this reason. Four decades of research has revealed that using several different simple carbohydrates together allows for better absorption than if the product was formulated with only a single carbohydrate. 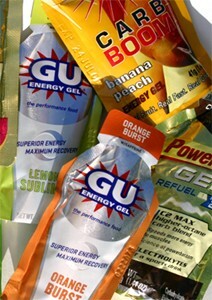 For example, Gatorade® is made from a mixture of sucrose syrup and glucose-fructose syrup. None of this is news to athletes. Athletes know to consume carbs every 20-30 minutes during prolonged competition. However, confusion can arise from the increasing awareness that a diet that is high in sugar and other refined carbohydrates (ie., these are mostly simple carbs, not complex carbs) does lead to health problems. That's correct. Sugar has been demonized for years. And high-fructose corn syrup is added to tons of artificially-sweetened foods (see below). HFCS is the dominant sweetener in soda pop, a beverage I feel you should completely eliminate from your diet! People who drink soda pop daily have a greatly increased risk of developing type-2 diabetes (Schulze MB, et al. 2004) and the metabolic syndrome (Dhingra R, et al. 2007). And, you've probably read stories about the health risks of "sugary fruit drinks." OK, if "sugary fruit drinks" are bad, and because sports drinks like Gatorade®, Powerade®, and others contain these same simple sugars, aren't sports drinks also bad for us? Again, the answer must be considered in the context of exercise. Sure, if you consume sports drinks regularly and don't ever exercise, then that's not good. But, during exercise, competition, or hard physical labor, rapidly-absorbed simple sugars like glucose, fructose, and sucrose are precisely what your muscles need. So, to summarize, don't fear carbohydrates. Carbohydrates should be the largest calorie source for both athletes and non-athletes. In sedentary people who want to lose weight, the carbohydrate portion of the diet can be as low as 50%, to allow for a higher ratio of protein-to-carbs. But, during vigorous exercise, carbohydrate intake should rise to 60-70% to provide the energy that muscles need. For health reasons, avoid excessive amounts of sugar and refined carbs. However, simple carbs like sucrose, glucose, and fructose are OK during exercise, competition, and hard physical work. If there is one dietary substance with a Dr. Jekyll and Mr. Hyde image, it might be fructose. Fructose is sweeter than sucrose. Fructose occurs naturally in honey (37% fructose) and apple juice (60% fructose). Table sugar is equal parts glucose and fructose, so, it is 50% fructose. Over the past 40 years, food manufacturers in the US have gradually shifted away from using sucrose (table sugar) as a sweetener in favor of using corn syrup with added fructose: high-fructose corn syrup. High-fructose corn syrup (HFCS) is easier for manufacturers to use and is cheaper. Fructose was added to corn syrup in ever-increasing amounts. Today, corn syrup in solid foods (eg., cookies) contains 42% fructose and corn syrup in liquids (eg., soda pop) contains 55% fructose (Elliott SS, et al. 2002). HFCS is routinely used in many artificially-sweetened, fruit-flavored snacks and beverages. But, it is also found in foods that might surprise you, such as multi-grain bagels, spaghetti sauces, chocolate milk, yogurt, Coffee-Mate creamer, Fig Newtons, and many other sources. It's likely that every one of us consumes HFCS every single day! • Fructose does not stimulate the insulin response that typically occurs when you ingest other sugars such as sucrose, glucose, lactose, etc (Elliott SS, et al. 2002) (Teff KL, et al. 2004). Without triggering insulin output, another hormone known as leptin is not released. And without a normal insulin-leptin response, the brain does not receive the proper signal to stop eating. For example, let's say you eat a 600-calorie meal and drink a can of Coca-Cola. Twelve ounces of Coca-Cola contains 140 calories, all from high-fructose corn syrup. But, even though you consumed 740 calories, your brain perceives the meal as containing only 600 calories. • In addition to its ability to promote overeating, fructose directly stimulates fat synthesis in the liver and in sub-cutaneous fat tissue. The Dietary Guidelines for Americans don't specifically address high-fructose corn syrup. However, other groups are very concerned about this food additive. On July 13, 2005, the Center for Science in the Public Interest (www.cspinet.org) filed a petition with the FDA requesting that "health notices" be placed on the labels of soft drinks. If you look at the label for PowerBars, the first ingredient listed is "high fructose corn syrup." And, as discussed above, you also find fructose in sports drinks. Elite endurance athletes like Tour de France cyclists and Iron Man competitors consume tons of PowerBars and sports drinks during competition. Is this unhealthy? 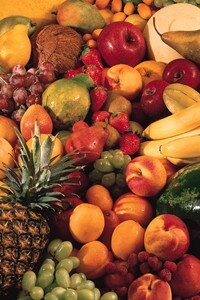 Here's where the confusion comes in: Fructose occurs naturally in bananas, dates, nectarines, peaches, etc. So, is fructose actually bad for us? ANSWER: The fructose that occurs naturally in fruits doesn't cause the same health problems as the fructose supplied as sugar and HFCS. Harvard nutrition expert David Ludwig, MD, PhD, describes a fascinating study from 1971 where a small number of subjects were instructed to eat primarily fruit (Ludwig DS. 2013). They averaged about 20 servings per day! This corresponded to a very high intake of fructose: about 200 grams per day. Yet, no health problems were seen: no increase in body weight, no adverse effects on blood pressure, insulin, or blood glucose levels (Meyer BJ, et al. 1971). The bottom line is this: if you are attempting to lose weight, you should definitely try to avoid food products sweetened with HFCS. Athletes and others who exercise regularly don't need to worry about the fructose in bananas or sports drinks. Having said that, athletes and weekend warriors should limit their consumption of sports drinks to only those times when they are exercising or competing...ie., sports drinks should not be consumed routinely throughout the day. 3) SODIUM: NO NEED TO RESTRICT...IF YOU PERSPIRE! Most people have probably heard the medical profession's recommendation to limit the amount of sodium (salt) in our diets. This is because sodium raises blood pressure. Limiting sodium intake is especially important for people with conditions like hypertension, congestive heart failure, and certain kidney diseases. Blacks should also limit their sodium intake because they are more sensitive to its effects than other races. However, if you perform aerobic exercise regularly -- particularly if you perspire heavily! -- then you can almost totally disregard these sodium intake limits. • "Salt" generally refers to table salt, which is sodium chloride. • "Sodium" is one of the 2 "atoms" that make up sodium chloride. 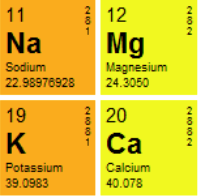 Sodium has a weight of 23 while chlorine has a weight of 35, giving sodium chloride a total weight of 58. This means that 5800 mg of sodium chloride (table salt) yields 2300 mg of sodium. ...and on and on. On packaged food labels, you will see the amount of sodium listed regardless of the source of that sodium. To get a perspective, compare the amount of sodium in Gatorade®, milk, bread, crackers, soup, soy sauce, cheese, and a can of peas. You'll see a wide range! But, during strenuous exercise, athletes can lose 1000 mg (or more) of sodium per hour. Thus, their sodium requirements can be much higher than 2300 mg per day. Further, if sodium loss is coupled with the consumption of large volumes of plain water, a condition known as "hyponatremia" can occur. (Translated, this term means "a low concentration of sodium in the blood.") Hyponatremia can cause confusion, disorientation, seizures, and can even be fatal. While anyone who drinks too much plain water while perspiring can develop hyponatremia, especially at risk are cyclists (because it is easier to drink while riding a bike than while running), females, and marathon-walkers (because perspiration -- and water consumption -- occurs over a longer period). So, athletes, and, for that matter, anyone who is perspiring heavily over a prolonged period of time (eg., an electrician or plumber working in a hot attic), should not limit their sodium intake. In fact, they may need to increase it. Check with your physician first if you have any of the medical conditions listed above. You may have heard the recommendation to drink "8 glasses of water per day." But that recommendation has no scientific basis. For most people, this amount is a lot more than they normally drink. The requirement for men is roughly 1 gallon per day. How many of you men out there drink this much water every single day? For the women, 91 ounces is roughly 3 quarts. 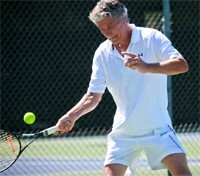 However, an exercising athlete can lose enormous quantities of body water through perspiration. The recommendations listed above don't apply to endurance athletes. So, then, how much should athletes drink? Unfortunately, there is no single answer that applies to all athletes because sweating rates for different sports can vary enormously. For example, researchers from West Chester University in Pennsylvania determined that cross-country runners should consume 4.6 liters of fluid per day and that football players require as much as 12.2 liters per day (Godek SF, et al. 2005). In the past, the recommendation for marathon runners was to "drink as much as you can." But, with over 70 cases of hyponatremia documented in athletes, distance runners are now cautioned to be more moderate in the amount of water they consume (during competition or training). The International Marathon Medical Directors Association (IMMDA) released a statement in 2002 that marathon runners should drink no more than 400-800 ml per hour. That's only 13 - 26 ounces. That's a good rule-of-thumb, but it's not enough in many other scenarios. For more information on fluid requirements during exercise, go to www.USATF.org. One of the best sports nutrition books I have read is Food For Fitness - Eat Right to Train Right by Chris Carmichael (2004). Even though this book is intended for serious endurance athletes, it provides a lot of common-sense information. The book is very easy to read, so average people don't need to worry about trying to understand a lot of complex biochemistry. 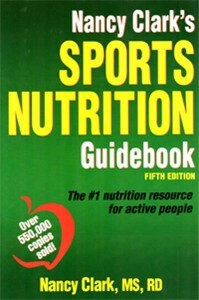 In 2014, Nancy Clark, MS, RD, published the 5th edition of her popular Sport Nutrition Guidebook. This book has sold over 550,000 copies. Nutrition Basics: Fructose, Public Enemy #1?